Bollinger Bands and Stochastic are some of my favorite indicators -- I feel a little lost if I see a chart without those indicators displayed. Bollinger Bands are are based on a moving average (aka the middle band) and two lines -- one plotted above the middle band and one below. Those other two lines are plotted some number of standard deviations away from the middle band (line). Typical setting are a 20-day moving average and 2 standard deviations. One usage of Bollinger Bands is to tell you how a stock (or whatever is being plotted) is on a relative valuation basis. If the moving average (middle band) is "fair value" (it *is* the average pice after all) then at or near the upper band is (relatively) expensive while at or near the lower band is (relatively) cheap. The bands *can* also act as support and resistance. That's more often the case if those lines are essentially flat. If & when the upper band starts sloping up that can be a sign of opening up to allow price to keep rising. AKA, an upper Bollinger Band Walk. The opposite is true for the lower band. Stochastic is an overbought / oversold oscialltor. Values over 80 are considered overbought while values under 20 are considered oversold. Note that if something is trending (as opposed to range-bound -- you can use an indicator like ADX to determine trending) overbought or oversold can remain that way for a long time. So you can't blindly use overbought as a sell signal -- ditto for oversold as a buy signal. From there you can see all the areas I circled and how they correspond to turning points. Upper band touches or approaches (especailly with flattish a flat(ish) line) with overbought stochatic is a decent warning sign. You may not want to outright sell but maybe you use those junctures as a sign to tighten your stops, take partial profits, hedge, etc. 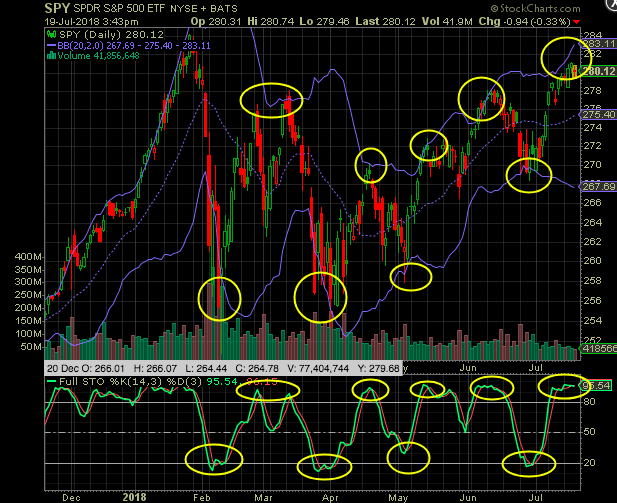 The opposite is true with lower band touches and oversold stochastic levels. I'm curious to see how the current situation plays out. Late last week the upper band was basically flat and the S&P was NOT trending and that had me tightening stops and taking some profits. Right now the upper band is rising. That makes me a bit more optimistic about whether the market can push higher without first going through a pullback or conslidation period. As I always say, there's no magic indicator or set of indicators but these have served me well over the years. Of course, you can use SwingTradeBot to scan for various Bolling Band & Stochastic junctures. (See the Bollinger Band scans & the stochastic scans) You can also blend them them via a Combo Scan. P.S. If you want to learn more about Bollinger Bands I recommend John Bollinger's book. It's listed in my Recommended Trading Books page.